Narrative: Firefighters responded to a reported basement fire and arrived to find an over-loaded electrical outlet was the cause of the problem. Crews shut of the power at the breaker and opened up the wall to check for fire extension. Address: 5:06 South "L" St. Narrative: Firefighters extinguished a fire in the engine compartment of a motor vehicle (car). Address: 616 North 3rd St. Narrative: Firefighters responded to a sparking power line with some arching below the insulator. Narrative: Firefighters responded to a reported kitchen fire and upon arrival found the problem was burnt food in the toaster. A public memorial service for firefighter Al Nejmeh is scheduled for 1 p.m. on Friday, May 31, at the Tacoma Dome Exhibition Hall. Nejmeh suffered a fatal heart attack on Tuesday, May 14, while providing emergency medical care at an incident. 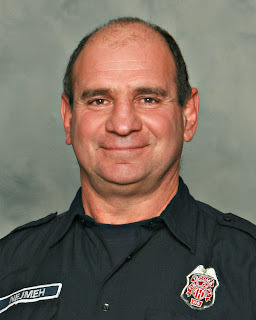 He was a 12-year veteran of the Tacoma Fire Department assigned to Ladder 2 at Fire Station 8, and served in a key role on the department’s technical rescue team. Friday, May 31, 2013 – 1 p.m. Narrative: Firefighters responded to a smoke alarm activation in a residential care facility and found no problems upon arrival. Narrative: Firefighters responded to a reported small electrical fire in a house. Upon arrival the determined electrical arching had caused the problem. Narrative: Firefighters extinguished a small debris fire in the yard of an abandoned house. Narrative: Crews responded to a reported kitchen fire. Unattended cooking lead to a grease fire on the stove-top, and Firefighters confirmed that there was no fire extension. Narrative: Firefighters responded to a prohibited outdoor burn of construction materials. Narrative: Crews responded to a reported kitchen fire. Unattended cooking lead to a fire on the stove-top, and Firefighters confirmed there was no fire extension and ventilated the apartment. Narrative: Firefighters extinguished a small brush fire. Narrative: Firefighters responded to a fire in the engine compartment of a motor vehicle (car). Address: 916 S. 13th St. Narrative: Firefighters responded to a reported dryer fire. The occupant had extinguished the fire prior to our arrival, and crews confirmed there was no fire extension. Address: 2601 N. Shirley St. Narrative: Firefighters responded to a reported brush fire. The homeowner was burning weeds with a propane torch and accidently caught a landscape hedge on fire. Crews extinguished the fire with a booster line and confirmed it had not extended to the residence. Address: 1003 S. Pearl St. Narrative: Firefighters extinguished a garbage fire started by a juvenile. TPD and the on-duty TFD inspector were notified for follow-up. Address: E. 35th St/E. "N" St. Narrative: Firefighters arrive to find a small abandoned campfire was smoldering. Crews extinguished the fire without incident.